Resting on Turkey's famous Turquoise Coast, Antalya is an outstanding resort that mixes Mediterranean fishing villages with natural wonders. With year-round sunshine and warm waters, holidays in Antalya don't come any better than this. You'll be able to witness the region's past first hand from the architectural delights in the Roman - Ottoman quarters, to the ancient statues of the Greek gods in the Antalya museum - all of this means your disabled holiday in Turkey will be full of awe and wonder as well as sunbathing. Concorde De Luxe Resort is a thematic hotel inspired by the famous Concorde jet plane, on the seafront of the Lara region of Antalya, famous for its natural beauties and the blue flag beaches. For a holiday with history and culture, and the magnificent sea, sun and sands of Antalya, Concorde De Luxe Resort is your ideal destination. Overlooking the Mediterranean Sea and situated within close proximity to Antalya International airport, this grand, palatial hotel is one of the most desirable all-inclusive hotels in the Antalya region. Luxury and originality in the dramatic form of the legendary transatlantic liner. Titantic Beach and Resort Hotel offers spacious rooms, high standards of specification, superb attention to detail and a complete range of amenities. 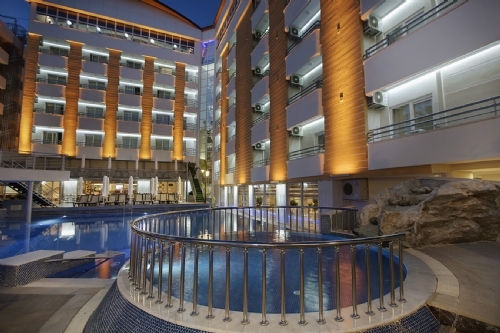 Limak Lara De Luxe Hotel & Resort reside in the Lara district of Antalya. It is located in 13 km from Antalya airport and 25 km from the city centre. It is a luxury resort hotel that is located along beautiful sandy Lara beach in Antalya/Turkey. Delphin Palace lies next to the beautiful Mediterranean Sea and solemn Toros Mountains on Lara Beach. It is only 15 kilometres away from the city centre and 10 kilometres from the airport. An oasis of tranquillity in the middle of the legendary beauty of Lara beaches, Delphin Diva Premiere is the shining star of the region with its facilities and location. Barut Lara Resort is a peaceful and tranquil 5 star hotel designed for couples, honeymooners and families. Staying at the hotel guests will be within close proximity to the city centre and the airport. Fame Residence Lara Beach is ideally located on the golden sandy beach, by the stunning Mediterranean cost. The luxurious 5 star hotel is only 16km from the Antalya city centre where guests can find a variety of bars, restaurants and many other touristâ€™s attractions. Delphin Imperial 5 star hotel is located on the glamorous Mediterranean coast in the Lara district which is only 15 km away from the city centre and 10 km away from the airport. Nearby the hotel is Lara Beach where guests can enjoy sunbathing, volley ball and water sport activities. Commodore Elite Suites & Spa is a polished, all-inclusive, adults-only resort on the fine and natural sands of Evrenseki beach. Give your holiday a touch of modern glamour at the Aska Lara Resort & Spa, one of Lara Beach's newest hotels with hip style, indulgent restaurants, and amazing beach facilities. This elegantly decorated 4* hotel offers guests a range of facilities to ensure an enjoyable and relaxing stay. Guests with limited mobility can stay in one of the specially adapted rooms the hotel has to offer. The Kleopatra Hotel is ideally situated in a city centre location nearby Kleopatra beach and 120km from Antalya Airport. Grand Okan, a luxury city centred hotel situated on the famous Kleopatra Beach has a perfect setting in one of the most picturesque corners of the Turkish Riviera. Set directly on an immaculate blue flag beach, the Crystal Sunrise Queen Luxury Resort and Spa is ideal for couples and families seeking a relaxing beach holiday. This spacious complex offers a host of facilities for all ages to enjoy. The 5-star Mirada Del Mar Hotel in the resort of Goynuk Kemer offers a superb location right on a Blue Flag beach, surrounded by greenery, and is ideal for a family or romantic holiday in Turkey. The resort is set in one of the most popular coastal destinations in Antalya. Bellis Deluxe Hotel is one of the only hotels in Belek welcoming its guests since 1992. The hotel is peacefully surrounded by green pine forests. The comfortable rooms offer a fantastic panorama of the turquoise Mediterranean. This luxe, all-inclusive seaside resort is 1.8 km from Troy Aqua, an aquatic theme park, and 5 km from Cornelia Golf Club. Youll feel brand new at Papillon Ayscha, equipped with innovative, modern and practical ideas. The Cornelia Deluxe resort is an incredibly luxurious, innovative 5-star hotel with an eco-friendly philosophy, acclaimed for its warm hospitality. It features a private, luxurious Blue Flag beach, on the shore of the Mediterranean Sea. Titanic Deluxe is located in Belek at the heart of the Mediterranean is a 30 min drive (30km) away from Antalya Airport and 9km from the city centre. Set next to the natural blue sea guest can experience spectacular views and relax on the beaches. Kempinski Hotel The Dome is situated in Kadriye near Belek, a 25-minute drive from Antalya International Airport and 45 minutes from Antalya city centre which contains palm-lined streets, beautiful parks, a picturesque marina and an abundance of restaurants, bars and nightclubs. Sueno Hotel Deluxe Belek is a luxurious beachfront hotel which boasts a fantastic range of facilities, from an unbeatable pool scene perfect for all ages complete with an adults waterpark and a childrens castle-themed pool to an impressive dining selection with a Food Court filled with snack outlets and a range of Ã la carte restaurants offering a range of cuisines from around the world.